After the launch of Windows Phone 8 everyone is looking around to have WP-8 devices with the cheapest price tag and so the competition is on. The Lemon company have introduced its full touch windows phone 8 device at just Rs 2999. But will this device make a change in the competitive market, can it change the world?? So, if you crave for the latest Windows Phone 8 OS but don't want to spend thousands of bucks for the device, then you can have a look at Lemon's attempt to offer the WP8 theme-based phone, mind you this is not a smartphone. 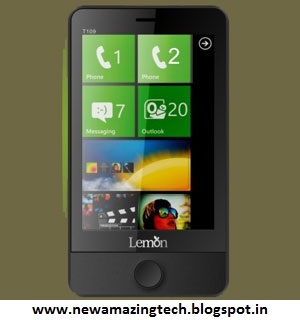 Lemon Mobile, is an Indian brand which sources its phones from China and the company has launched its new phone with a user interface that looks exactly like WP8 OS interface. The phone, called T109, is a Java based feature phone and not a smartphone. Interestingly, the phone has a 9.3-cm (3.7-inch) touch display, which too is a very common screen size for Windows Phone 8 devices from the likes of Nokia, Samsung and HTC. Lemon T109 is a very basic dual SIM feature phone with a 1.3 MP rear camera, 1,200 mAh battery, and expandable memory slot for up to 16 GB. The company is also offering you a chance to get a Reebok watch and 4 GB micro SD card for free with this phone. The Lemon T109 is priced at Rs 2,999.
may be the latest smart phone platform, but it has already taken significant market share and poses a big aggressive threat to iPhone, Android, and BlackBerry. Thanks @garlie charis for sharing this but still its the cheapest windows smartphone.